Kaley Cuoco’s wedding day was all about personalization. The Big Bang Theory actress married her love, Karl Cook, in an elaborate ceremony on June 30, on Cook’s farm in Rancho Santa Fe, California. Cuoco’s wedding planner, Lauren Tatum, who’s now worked with the actress for six years, tells The Knot that her goal for the wedding was to make everything “them,” as in highly personalized in detail. The ceremony itself incorporated the couple’s many pets—including their dogs and Cuoco’s pet mini horse Shmooshy—while Cuoco’s sister Briana officiated. The subsequent reception, however, was where Tatum made sure things got even more personal, including everything from a giant ice luge embellished with symbols of their love (there was a horse! their initials! a 1920s car!) carved into the ice itself, all the way to a dessert bar with the pair’s favorite sweets and treats. The reception, which was held in a two-story tent, also allowed for Cuoco and Cook’s guests to get prime views of the couple even if they were scattered throughout the space. Here, some more details about the happy couple’s big day. “It’s their favorite place,” Tatum says of Cook’s farm, where they held their outdoor ceremony and then indoor (well, in a two-story tent) reception. The aisle leading to the altar was made entirely of hardwood, allowing for Cuoco to teeter toward the front without worry. The entryway to the tent for the reception was lined with swoon-worthy fairy lights, and the tent itself had “two upstairs sections on either end for people to look down over onto the dance floor and tables,” Tatum says. Cuoco and Cook opted for a smaller wedding party (Cook had two groomsmen, while Cuoco had just one bridesmaid), but what they lacked in human support, they more than made up with in animal solidarity. Cuoco had a few outfit changes throughout the night, though her first wedding dress is the one that may just take the cake for most elaborate and ethereal. The gown, an embellished lace number with a matching cape, was made by Reem Acra; her ceremony look was styled by Cuoco’s close friend Brad Goreski and stylist Daniela Romero. Once the more official part of the day was over and the fun was about to begin, however, Cuoco changed into a white lace jumpsuit by Tadashi Shoji and put her hair up into a high ponytail. The look and feel of the event was 1920s glam, according to Tatum. And glamorous, it most definitely was! The couple exchanged vows before an enormous floral arrangement made up of all kinds of roses, peonies, hydrangeas and pampas grass in lush pink and champagne shades. “The florist was down there working for three days straight!” Tatum says. Additionally, at the reception, the couple opted to carry the wooden, rustic theme into the two-story tent with wooden cutting boards in place of plates. “We had those personally made,” Tatum says, adding that Cuoco and Cook opted to keep all the boards afterward, to be used at the farm. With the wedding cake, however, Cuoco and Cook opted to go a different route. The pair offered up an entire smorgasboard of desserts in place of a more traditional wedding cake, including cake pops and cupcakes that had pictures of all the animals on them, as well as pictures of Cuoco and Cook. There was even a nitro ice cream station where guests could get a waffle bowl and load up on homemade ice cream. “There was dry ice billowing out of that room, which was super cool,” Tatum says. 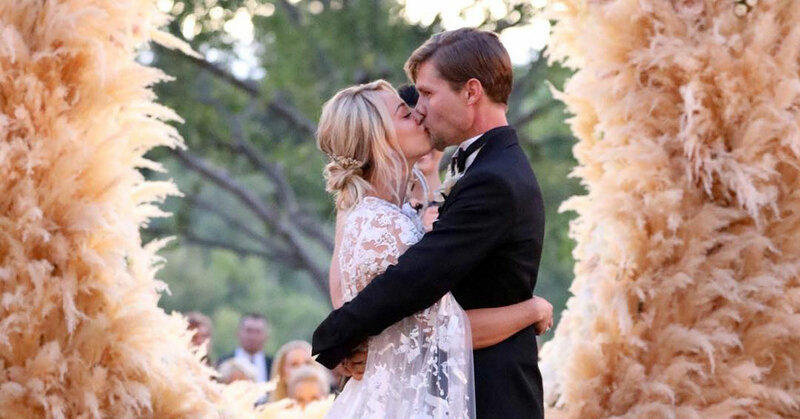 Be the first to comment on "Exclusive: Kaley Cuoco’s Wedding Planner Reveals Details From Her ‘Romantic’ Ranch Wedding to Karl Cook"